JOHN’S, N.L. – Our love for the game of hockey lies in the hearts of countless volunteers across the nation, hoping to share their passion with the next generation of Canadians. On Friday, Hockey Canada recognized this passion, and dedication to the game at the organization’s Spring Congress, this year held in St. John’s. Congratulations to the eight recipients, and to all the volunteers – we say thank you. 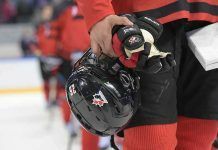 Nominations for all awards were submitted by Hockey Canada’s 13 members, and the winners were chosen by a Hockey Canada selection committee. The success of minor hockey associations in Canada depends heavily on volunteers and Hockey Canada is pleased to recognize the individuals who contribute greatly to the game of hockey from coast-to-coast-to-coast.